Over the past few weeks, we have talked about both family style meals and how to handle when our children only eat their love it foods. Family style meals diffuse the battles for sure. But my picky eaters always tend to pick the same foods (fruit, bread, etc) so I wonder if it's still worth doing if they don't really try anything new. Know what I mean? ...Is it still worth doing if they don’t really try anything new. I think if there is one question that gets to the heart of my mission at Veggies & Virtue, it might be this. As a health practitioner, it is my job to convince parents that yes - it is “worth it” to invest in our children’s health in this way, early on, through feeding them in ways that help them grow into being a competent eater. As a parent, however, I recognize firsthand how defeating it can be to feed kids who aren’t naturally adventurous eaters or inclined to try everything offered. So let’s take time this week to evaluate this underlying wonder so many of us parents have amidst the untouched meals. Note: This page includes affiliate links. All opinions are my own. The reality is that for most of us parents, we use an objective measure of “worth” in the feeding relationship based on if/whether and how much our child ate of a given food. It is understandable why we look at a meal and deem its success in that way. But I promise you, you are setting yourself up for failure, frustration, and disconnect in your feeding relationship with your child if we continue to consider you “wins” in such a way. If you have ever followed my Food Win Wednesdays before, you know that I get about as granular as it gets. That’s because whether it is in my own family or in working with clients, rarely ever are our most genuine wins big, overnight ones. Instead, the success we see in raising healthy eaters tends to be small...really small. At to that it also being VERY slow, particularly with kids who are picky eaters, and it is no wonder why so many parents I work with feel like they are getting no where in trying to offer healthy options. This continual questioning of if progress is happening leads to a parent’s natural wonder of if all their time, all their energy, all the food that gets wasted is really even worth it. So let’s redefine worth here. Worth is NOT an objective measure of what is eaten (or not). If it was, then so many of us would have to reduce everything we do as part of our role in the Division of Responsibility in feeding as worthless. But what if we re-evaluated worth in the context of feeding the same way we do in other areas of parenting? Is it worth it to drive our kids 30 minutes each way for a 15 minute swim lesson that costs $35 per class when they still don’t even know how to swim? How long is it worth it to us to consistently show up and entertain this crazy song and dance when our kids still can’t swim? Is it worth it to us to commit to singing the ABC’s 842 times before our kids ever echo it back? How long is it worth it to us to consistently show up and entertain practicing letters, uppercase and lowercase, sight words, and board books when our kids still can’t read? Is it worth it to us to commit to reminding our kids 10,052 times as toddlers to be kind if they are going to steal toys and hit other kids anyways? How long is it worth it to us to consistently show up and entertain play dates where they practice how to play nicely and kindly treat others, outings where they learn how to act in public, and social situations where we face more meltdowns than make-mama-proud moments? If we look at any of these common things we commit to doing with our kids as binary worth of swimmer or not, reader or not, respectable member of society or not, then a lot of us are still flat failing - myself included. That’s because for most of us, we are still in the trenches. Our kids are still so little. And with that, their skills are still so immature. Sure we have invested A LOT into their eating and hopefully, their eating well. But for many of us, it is still really hard to see the worth. So we can either decide, “this is worthless” and stop showing up to meal after meal and snack after snack. Or, we can decide that we are going to keep entertaining the idea that someday, down the road, this investment we are making in our small kids will all prove worth it…one small win at a time. Just as our kids grow into capable swimmers, readers, and kind citizens of society, they too will grow into competent eaters. We just need to continue to show up, even when meals go untouched, and to zoom in our lens a bit closer. If we look close enough, we can begin to see this approach to feeding is worth it. The return on our investment just isn’t overnight. This is kind of a cliche phrase and yet, for good reason particularly to us as parents. Our kids eating perfection is not what we are after. What we do want, and how we will begin to redefine “worth” in the feeding relationship is by seeing gradual progress. One resource that I love and think is not shared nearly enough in the feeding world is this diagram of the steps of eating. Created by feeding experts from the SOS Approach, this visual puts to shame the often recited advice to “expose your kids to something 10-20 times.” This advice literally makes me cringe when I hear people say it. Even well-intended professionals say it ALL. THE. TIME. The reason I rarely quote this piece of evidenced-based advice though is because I know firsthand how defeating it can be when you do offer a new food 10...11...12...20+ times and still, your kid doesn’t care. Then what? Are parents just supposed to stop offering it? No. Parents should be encouraged to be look for signs of progress with that one food as well as in signs for progress in their child’s overall diet that are indicative of progress in other areas as well. This diagram, in my opinion, does that. It gets to the point that SO many pieces of advice on picky eating miss. That is, children may take years to learn to like new foods. If it is a nourishing food though, nutritionally, socially, spiritually, or physically, then we as parents are to continue to help them learn to like it in as many age-appropriate ways as possible for as long as possible until they learn to like it. We are all entitled to have foods we “don’t like.” However, when our children are still young and often have many more foods on their “don’t” versus “do” like lists, we set them better up for success in developing a lifelong healthy relationship with all foods when we evaluate progress in an ongoing manner. Identifying the 32 steps to eating that are actually required to move a child from offering to eating a new, “learning it” food can be a transformational thing for parents. In doing so, both “worth” and “progress” are quickly redefined into smaller, simpler acts of “eating” that don’t undermine the progress made even when no food is actually consumed. There is a reason why I never labeled this category, “Don’t like it” foods. That would quickly blacklist a lot of foods that we would like for our children to enjoy over the course of their childhood but ones that they might not instantly do so with or might enjoy for a time only to later reject. That’s because, like swimming, reading, and relating with others, our children have to LEARN these things. As infants, they have to learn how to eat. As toddlers and then throughout their childhood, they have to learn what to eat. So how do we help them do that? Let’s evaluate some strategies for how to help a child who won’t eat any of their learning it foods. What would you do if your kids wouldn’t eat any of the learning it foods? Chances are, we are jumping too far ahead of ourselves and assuming our child to immediately tolerate and instantly eat a new food. Since we often hear it can take 10-20 exposures for a child to learn to like something, we often look for quick success or at least obvious progress. However, this may not be the case. When we slow down the learning to like process to be more alike any other process we are familiar with helping our child grow and develop in, we begin to see strategies for smaller, every day successes. We begin to redefine “success” and the worth of our child’s efforts and our own, and we begin to recognize the progress by not focusing on perfection. Child eats the learning it food independently! In sharing a summary of the 32 steps to eating, I believe parents are better able to understand why children need to be given endless opportunities to learn to like learning it foods. With some foods, a child may progress from tolerating to eating rather quickly. With others, a child may need several exposures to even move from one category to the next. Other times, a child may be eating a food and regress back to the beginning of the process for some time. Whatever pathway a child takes in general, overall, or with a given food, parents can take heart that progress is taking place when they see their child initiate steps towards eating. 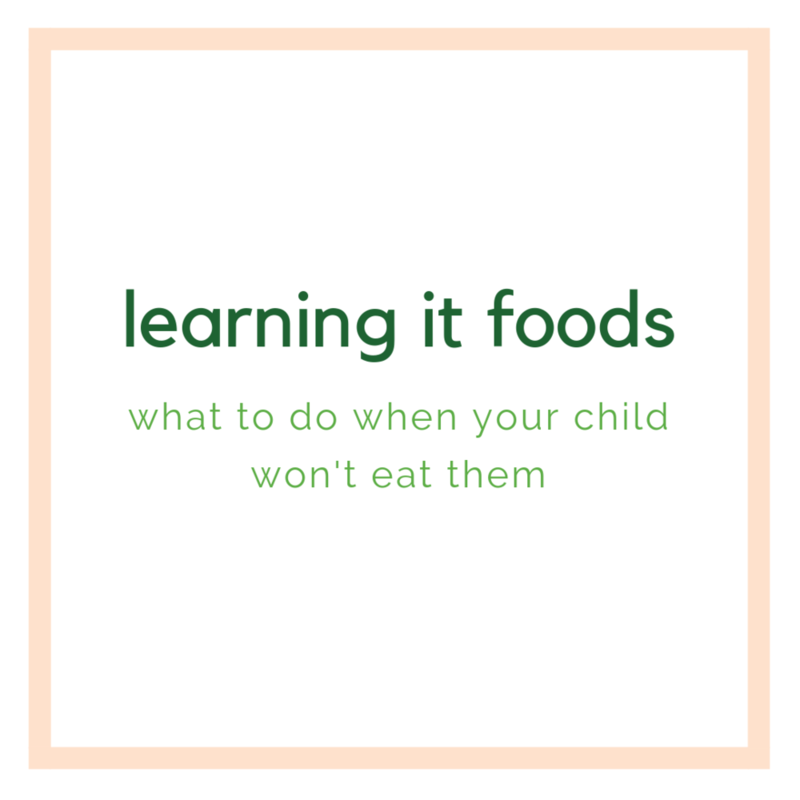 I challenge you, if you are struggling to know what to do with the long list of foods your child is still learning to like, do this. Print out my Love it, Like it, Learning it download. It includes 150 suggested foods and a Love it, Like it, Learning it template to plug each of these foods into for your child/family. You can do so by entering your email here. 2. Go through the foods you most want your child to learn to like. These might be because they’re commonplace in your family’s diet, have nutritional benefits lacking in your child’s diet, or are a food similar to a known love it food that you think your child could easily learn to like. Whatever the food, identify 5-10 foods you want to begin being more intentional about exposing your child to. 3. Start identifying where your child is at in their steps to eating towards each learning it food. Meet them where they are at and commit to allowing them to work through each step at their own pace, while also fostering a feeding environment that gently encourages them along in the process. Help them to find ways to tolerate, interact with, smell, touch, and taste these foods! This process is not a quick fix but it does create lasting results. We can raise up children who eat what they are told OR children who learn to love the healthy options offered. By allowing our children the independence to self-feed learning it foods within the context of what, when, and where we offer them, can help them to lose their neophobia and gain a newfound freedom with new foods one sniff, touch, and taste at a time! I keep seeing all these posts pop up about giving ourselves permission to eat pie, consume what we want, stop when we are full, and many other rights that relate to intuitive eating over the holidays. Why is it then that it’s so hard to give ourselves permission to push pause? Be it over the holidays or in life after a little one comes along, it seems so hard to give ourselves permission to push pause. As moms, I think part of it is the guilt game is strong. If we aren’t failing our kids, we often feel we are failing our careers or vice versa. If we push pause somewhere, that inevitably means we aren’t giving or being enough elsewhere. That’s what maternity leave is for isn’t it? A time when our lives are reduced down to the most simple and pure state of what is deemed “enough.” To settle into a season with a new little human (and possibly addition) in our families. To create space to heal and to grow, to allow margin from other demands, and to protect a small window of passing time when whatever we can give to the lives within the walls of our home is enough. To say: My newborn snuggles are enough. My attempt at special time with each older kid is enough. My spit up covered shirt and less-than-cute nursing bra underneath is enough. My exclusive use of curbside pickup for groceries is enough. My reheated coffee (x3) today is enough. My sub-par freezer meals for dinner are enough. My one shared story before bedtime instead of two total is enough. What I am giving is enough. The internal struggle though to truly accept “enough” in these early days of caring for a new life is real. After our first, I was a full-time stay at home mom. I soaked up every second in the early days and had no other competing interest other than caring for her. My husband worked almost 80 hour weeks, so it was just she and I most the time. I knew I was her everything in that season and boy, I embraced it. But eventually, it got so lonely and “just” staying home didn’t feel like enough anymore. I didn’t have friends (yet) with kids and I began to want “something else.” What had been enough initially led me into a season of wanting more. I started being interested in food photography, the world of blogging, and how I could continue dabbling in my career from the comfort of my own home. In the Fall before our second child was born, I started a website sharing it only with my mom, best friend, and a few others. After our second, my husband and I struggled. We wanted to love and bond with our new baby, but the endless crying nearly consumed us. We had prepared to help our oldest in the transition, but we were not ready for how hard some infants could be ourselves. The week we began to research hiring a night nanny, our daughter was almost three months old. She finally turned a corner and things began to get better in our home, but our life as a whole otherwise got turned upside down. After an intervention on my dad and ultimately his passing when our second was eight months old, everything with my business ambitions and professional aims were on pause. I was mom of two and next of kin with no mental or emotional energy to invest elsewhere. Eventually I got back into finding a balance between work and home life and allotted any spare time I could create into building Veggies & Virtue. I had almost a solid year of twice weekly preschool days to invest in something that truly has become such a dream come true before we found out we were expecting our third child. That’s what brings us to now. We had our third child in August, and he couldn’t be any sweeter of a baby. We have been able to reclaim the joys of newborns that were honestly lost last time and own the desire to hog the baby versus hand him or her off. However with a family that is now full and a business that has grown, the very things that are all such a gift, a true blessing, and a humble reminder of all we have been given, are also a lot. Compared to when I started out searching for and seeking “something else” as a new mom of one, life is different now. My baby is different, my marriage is different, and the needs of my older kids are different. When there isn’t “enough of me to go around,” I have to be mature and mindful enough as a mom, as well as a health professional, to know when to push pause and prioritize what is in fact, enough. I spent the summer months trying hard to get ahead for an intended maternity leave. I thought that by creating enough content for a projected six weeks of such “leave,” it would lend me some “time off” to care for the little people in my life. The reality is though, in the now 12+ weeks since Owen was born, I barely feel as though I have worked less. My email autoresponder saying I was “unavailable” didn’t actually stop me from replying to many emails nor did it redirect any of my work elsewhere. My social media use has indeed been less and forced me to make a few modifications to be able to manage it, but it remains something that literally never sleeps nor stops. My blog has continued to post and my newsletters continue to be published. I launched a beta e-series for Love it, Like it, Learning it, which started only weeks after Owen was born. I pretended I was “still here” with all the automation tools available and all it did was indeed, keep me mentally here, there, and seemingly everywhere… except the one place I so wanted to be: snuggled up with the sole job of loving on my three littles. Being able to work for myself is a blessing. I have tremendous flexibility to allow for family life, which I am so thankful for. With this, I also have constant temptation though. I never leave the office nor have accounted hours for work or to be with family. Between newborn nights and two preschoolers (neither of which who nap), my work days never go uninterrupted nor as planned. Sometimes my only dedicated time to sit at a computer only lasts for the twenty minutes it takes our little guy to nurse from both sides. I have no one to direct work towards when I’m away nor an organization that keeps operating in my absence while “on leave.” Even if someday a VA would be uh-mazing, I’m not there yet. So me, myself, and I have to be enough. And right now, there is just not enough of me to go around. What I know from this time last year is that my kid’s littleness won’t wait for me. The memories I want to be fully present in will pass whether I’m 100% there or not. The gifts I want to give others of my time and service aren’t those seen on social media. The needs most pulling on my heart strings aren’t those penciled on my planner. The “enough” I may never feel I have achieved professionally is actually rather obvious at home… when I am willing to push pause and choose that it is indeed enough for me. That’s why for the remainder of 2018, I am giving myself permission to not post any new content on my site. I will still have plenty of work to do to get ready for the New Year, but in terms of blog posts, I am pushing pause. By making a post out of this announcement (and probably sharing TMI, I know), I am attempting to keep myself accountable to this commitment. I am also hoping that in sharing this piece of my heart, I might encourage another mom out there who needs such permission to push pause too. I know in each of our jobs (be it at home or in an office), this type of “break” might not be possible around the holidays. But for those of us who might have the only thing holding us back being ourselves and our never-ending “yes” nature, my hope is that we recognize how sometimes saying “no” helps us see what is actually enough. Often when we step away from some of the to do’s that can wait and ambitions that are intended for another day, we can better enjoy the small, the simple, and the sweet moments we too often miss when we are so spread thin. I am going to do this, and I hope to whatever extent you are able to, you do too. Happy Holidays, mama. You are enough. By entering your email address, you will become among the first to hear from me about my blog content and exciting new updates in the New Year! I look forward to the opportunities to come and engaging with you again in 2019!